"What has been lacking until the moment of this book is an entirely new way of understanding food and eating." "Anne-Marie Fryer has made an invaluable contribution to the growing movement to bring mindfulness into the art of making a home. By helping cultivate your awareness of the subtle forces present in food and ways to harmonize with them through cooking, this practical and profound book will not only benefit you and your family, but the entire planet." "This is a friendly and poetic book. While the reasons given for food choices are based on the spiritual approach of Goethe and Steiner instead of on science, they do actually conform to the most up-to-date scientific nutrition. A pleasure to read - it sent me into the kitchen. The recipes are very nice too." "Cooking delicious nourishing meals - with heart and soul - is easy, fast, and fun with this great guide. Everything you need to know is right here - along with exercises and experiences that will help you love cooking, love yourself, and love the earth." CLICK HERE To read the Foreword by Robert Sardello. Anne-Marie Fryer Wiboltt is a Waldorf class and kindergarten teacher, biodynamic farmer, author and nutritional counselor. She has taught nutritional cooking and counseled for 25 years in her homeland Denmark, Europe and the United States. She trained as a macrobiotic cooking teacher and counselor and studied the principles of oriental medicine and the research of Dr. Weston A. Price before embracing the anthroposophical approach to nutrition, food and cooking. 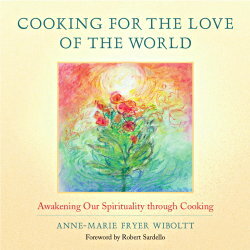 Anne-Marie co-authored with her husband a series of ten books on health and nutrition and is the author of Cooking for the Love of the World, Awakening Our Spirituality through Cooking. She is currently working on another book, Cooking for and with Children, Preparing for the Life of the Future.